To Cite: Zazouli M A, Safarpour M. A Systematic Review of Organochlorinated Pesticide Residues in Caspian Sea Fishes, Health Scope. 2017 ; 6(1):e36279. doi: 10.17795/jhealthscope-36279. Context: The worldwide production and application of pesticides, especially organochlorine in agriculture can have adverse environmental pollution and human health risks. Thus, this review evaluated and summarized the toxicological data on the existence and concentrations of organochlorine compounds in Caspian sea fish tissues. Evidence Acquisition: The data were collected from published articles in PubMed, ISI, SID, Google Scholar and so on. Results: The review showed that nine studies were recorded in databases about pesticide residues in Caspian sea fish tissues. These studies reported that there is limited evidence of organochlorinated compounds in Caspian sea fishes. All researchers detected organochlorine contaminants in examined fishes in the studied area, however DDTs was the predominant pesticides. Heptachlor, Polychlorinated Biphenyls (PCBs) and Linden were ranked next, respectively. Conclusions: In conclusion, toxicological studies showed that, although contamination level in Caspian sea fishes was relatively low, the present status might pose a risk about food chain contamination. 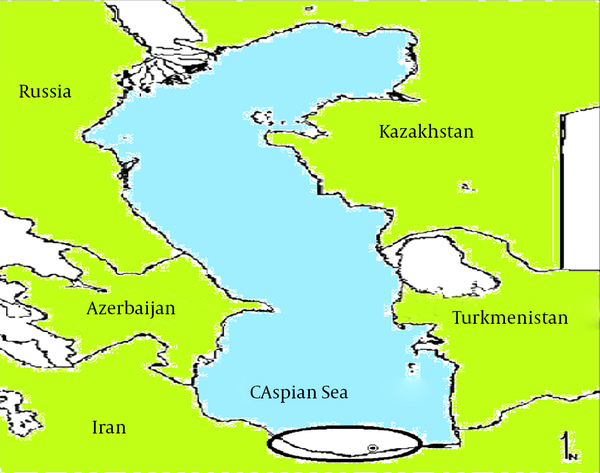 The Caspian sea (CS) with a volume and surface area of 78000 km3 and 380000 km2, respectively, is the biggest land body of water in the world and a unique system that is surrounded by five countries: Iran (900 km), Azerbaijan, Turkmenistan, Kazakhstan and Russia (1). The Caspian sea has about 130 river inputs, but no output (1-3). Various pollutants have accumulated in the Caspian sea due to many human activity sewages, agricultural and industrial waste flowing into the landlocked system, which threaten directly or indirectly environment and human health especially through the food chain (4, 5). The use of pesticides and fertilizers has been substantially increased to increase additional production of crops around the world as a consequence of increased human population (6-8). In spite of the potential to prevent and control insects, disease vector and weed, some pesticides such as Organochlorine pesticides (OCs) can be toxic to human health, wildlife and have deleterious impacts on the environment (9, 10). There is strong evidence on the association with a wide range of diseases and exposure to pesticides (11). Exposure to organochlorine pesticides may result in health-related complications including reproductive defects (12, 13), carcinogenic effects (14) breast cancer risk (15) and behavioral changes (16). Organochlorinated pesticides are chlorinated hydrocarbons that are composed primarily of carbon, hydrogen and several chlorine atoms per molecule (16, 17). Due to their hydrophobic characteristics, resistance to degradation, toxicity, least solubility in water, bioaccumulative nature, low vapour pressures and long-range transport and trans-boundary dispersion, the control of OCs in the environment is a real necessity (6, 17-19). Some of the most representative compounds in this group are the Dichlorodiphenyltrichloroethane (DDT) and its analogues, isomers of Benzene Hexachloride (BHC), heptachlor, chlordane, aldrin, mirex, chlordecone, toxaphene and some isomers of Hexachlorocyclohexane (HCH), such lindane (17). Organochlorine pesticides break down slowly in the environment and bioaccumulate in the food chain such as fish tissues (16, 20). The objective of the present study was to conduct a systematic review of the available literature to assess the toxicological data and to give an integrated illustration of the concentrations of organochlorine compounds in Caspian Sea fishes. 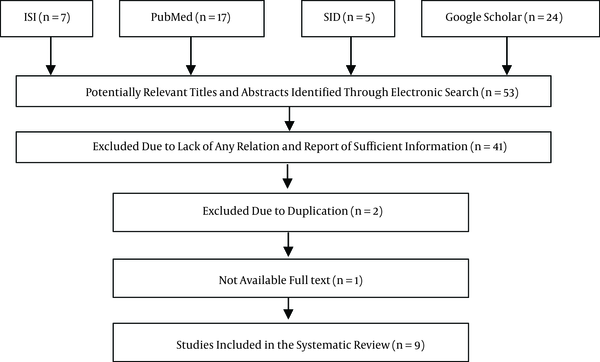 All titles or abstracts of publications in English and Persian language were screened by a search of four Internet databases (PubMed, ISI, SID, and Google Scholar) from 1999 to 2012, to identify suitable articles. Various combinations of the following key phrases were used: Caspian Sea, organochlorinated pesticide, fish, environmental toxicology. A study was considered for further review if 1, it referred to organochlorinated pesticide residues in Caspian Sea fishes; 2, and if the publication presented original Data. A publication was excluded if it had the following criteria: non-English or non-Persian language publication, book chapters and published articles that reported pesticide contamination in animals except fish; these items were unavoidable limitations in our study. The following data on the study characteristics were derived from each included study: the first author's last name, publication year, geographic location, type of fishes and pollutant studied. No modification of original data was done. The basic characteristics of outcome data from eligible studies in this review are reported in Table 1. The electronic searches identified a total of 53 articles, 41 were excluded after title and abstract screening due to lack of relationship and report of sufficient information. Two articles were duplicates; one was excluded for inavailability of full text. Figure 1 describes a flow- diagram for the articles screening procedure. In total, the nine remaining articles met the inclusion criteria and our main focus was on these studies (5, 21-28). Various pesticides were evaluated in each study. The details of pollution levels in fishes for each of the nine included papers are presented in Table 2. As can be seen from Figure 2, the study areas are shown in green color. A few studies or reviews have been published in databases about pesticide residues in Caspian Sea fish tissues. All these studies reported that there was clear evidence of organochlorinated compounds in all examined fishes collected from the Caspian sea. Table 3 presents the outcome of the DDT pesticide contamination levels in different years. The studies ranged according to the time of sample collection from 1993 to 2008. Compilation of available data from surveys indicates a downward trend of contamination. The DDT levels in samples collected showed a rapid decline during 1993 to 2008. Details from each study are summarized in Table 3. This result suggests a sign of extensive usage of organochlorinated compounds in the past, around the Caspian Sea region. In 1969, the usage of DDT was banned in the former Soviet Union, which may be an explanation for the slow decline of DDT. Maximum residue limit (MRL) established by food and agriculture organization of the United States (FAO)/world health organization (WHO) and acceptable daily intake (ADI) for five pesticides are summarized in Table 4. For example this study shows that the concentration of DDT in most studies exceeded the MRL value. Concentrations of DDT in studies of Vaezzadeh et al. (25) and Shokrzadeh lamuki et al. (23) on lipid weight basis were found to be less than the standard value. To the best of our knowledge, this is the first review paper of OC contamination in Caspian fishes. Although a number of comprehensive studies dealing with OC contamination in other lakes have been conducted recently, investigations in Caspian Sea are limited. This review summarizes reported contamination levels in fish of the Caspian Sea and suggests that organochlorinated compounds exist in various fish samples in Caspian Sea areas. The residue pattern was in the order of DDT > Heptachlor > PCBs > Linden. Additionally, the available data indicate the average concentration of organochlorinated compounds to be less than the Maximum Residue Limit in recent studies. Although contamination level was relatively low, the present status might pose a risk for accumulation of OC in the food web and effects human health and wildlife. Authors’ Contribution: Design and conduct of the study Collection, Marjan safarpour; management, Marjan safarpour; analysis of the data, Mohammad Ali zazouli and Marjan Safarpour; preparation, review, and approval of the manuscript: Marjan safarpour.